Did you know that waxing your skis or snowboard helps you ride faster and even protects your gear? 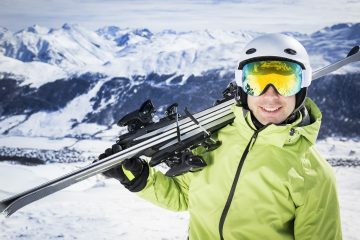 No matter if you’re a beginner skier or snowboarder or an expert investing in your own gear, knowing how to wax skis and a snowboard is an essential skill that will make you a better rider and save you money over time. But how do you do it and what do you need to get started? 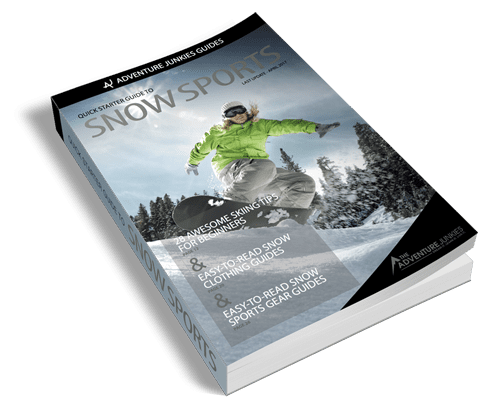 Here at The Adventure Junkies, we’ve made it our personal mission to tell you everything you need to know about waxing your snow gear as clearly as possible. In this guide, you’ll learn what type of equipment you’ll need, how often you should wax your gear, and why it’s an essential part of maintenance. When the surface of your snowboard or skis run over the surface of the snow, a thin layer of water forms. 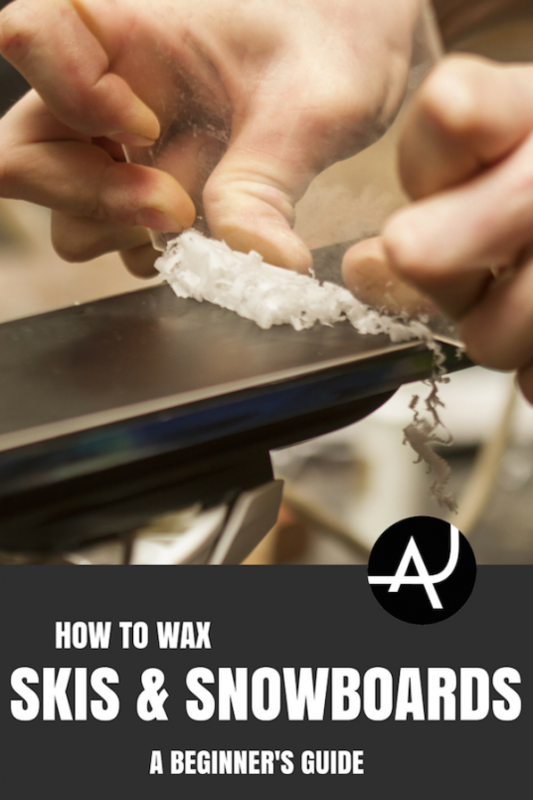 Wax helps the snowboard or skis glide over the snow more efficiently, helping you ride faster. A waxed base also helps with agility, making turns easier and sharper. A waxed surface also acts as a small buffer when you hit rough surfaces, protecting it from scratches. Wax also prevents your board or skis from drying out, acting as a thin lubricant to keep it the base from cracking. 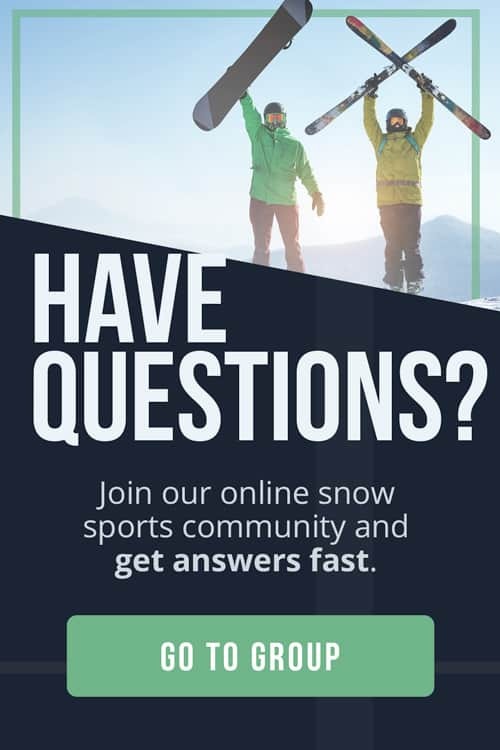 In need of new gear? 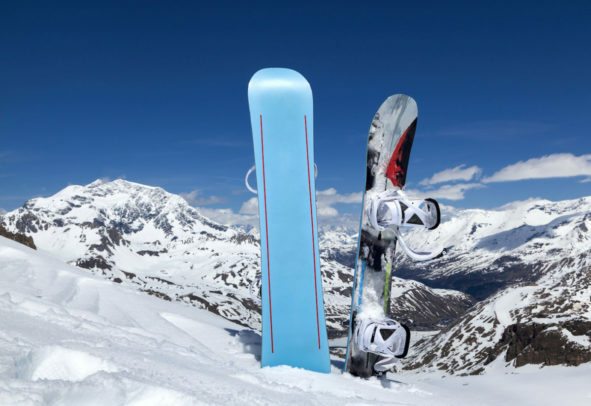 Then you have to read our guide on how to choose the best snowboard or pair of downhill skis. You can wax your skis and snowboard at a shop, but the cost adds up quickly and the quality varies a ton. Waxing machines are never as good as a hand applied wax, and you never know if the person doing it by hand is sloppy. It’s better to wax your skis and snowboard yourself to save money and ensure that it’s being done properly. 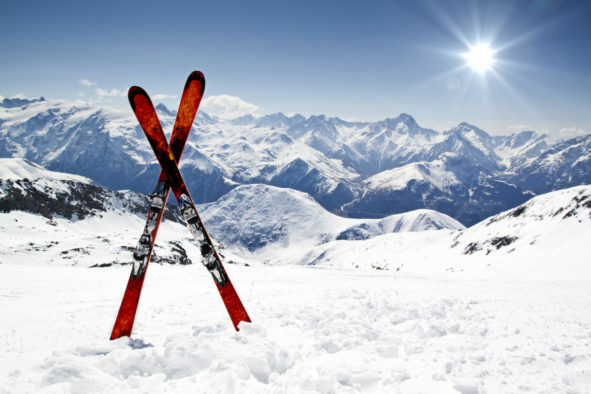 Wax for skis and snowboards is made specifically for snow-sports equipment and often varies also for different riding conditions. Warm weather wax tends to be softer while cold weather wax dries much harder. To find out what wax is best for your local mountain’s conditions, check out a helpful resource on choosing wax from Gear Patrol. Cross country skiers should use a grip wax that helps the skier grip and move forward, but then helps the skier glide once they start going downhill. Downhill skiers and snowboarders use glide wax that simply focuses on making the rider go faster. If you’re not sure what wax to buy or you often ride in all types of conditions, buy a standard block of all temperature wax. There are specific snowboard and ski waxing irons that are generally smaller than your average clothing iron. Wax irons maintain a steady temperature and are worth the investment if you’re a regular skier or snowboarder. However, an old clothing iron works fine as well if you use it on a low temperature. The important thing is to make sure you never use your snowboard or ski wax iron on your clothing after you’ve used it on your snow gear. Though it might look like you’ve gotten all the wax off the ironing plate, there is probably still a little bit on there that can transfer onto your favorite kitty-cat T-shirt and ruin it. We don’t want that to happen, do we? For a cheap option, simply buy an iron for a few dollars at your local thrift store and keep it solely for snow gear waxing. 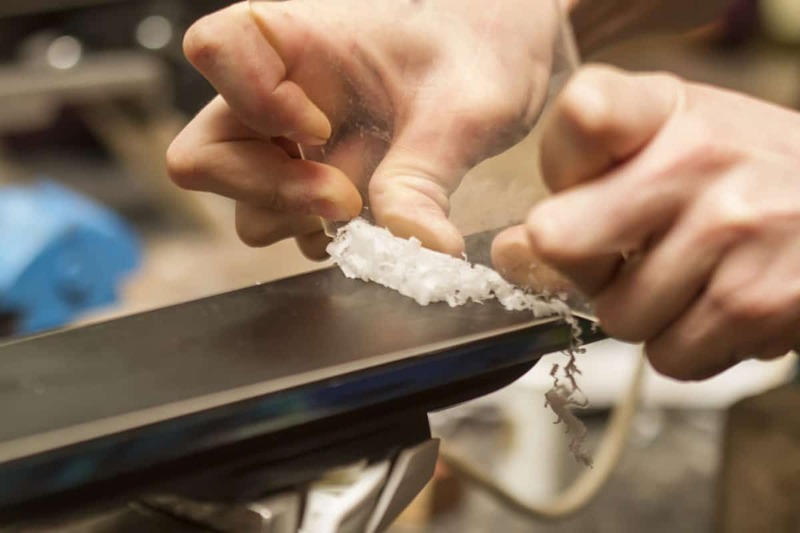 To scrape off the wax after melting it onto your skis and snowboard, you’ll need a stiff plastic scraper. Though some people use a credit card or thick piece of plastic, a dedicated wax scraper works much better because it’s less flimsy. They aren’t very expensive and can be purchased at your local ski and snowboard shop or online. For the final step in waxing your skis and snowboard, you’ll need a semi-coarse pad to polish off any leftover wax. How many pads and brushes you use depends on your preference. Many riders find that one general use buff pad that you can find at the grocery store is enough to do the job. Others have multiple brushes in varying coarseness levels to ensure that the wax is put on as perfectly as possible. A stiff nylon and soft nylon brush should be enough to buffer the wax down to a thin layer. Before you wax the bottom of your skis and snowboard, it needs to be clean. Rinse and wipe down the surface of your gear so that there aren’t any debris hanging around. You can Scotch-Brite or Fibratex to remove any old wax – but only sparingly. If you haven’t gotten your skis or snowboard tuned in a while, you might want to do that before waxing. While wax helps you ride faster, you’ll gain more speed and responsiveness with gear that’s recently had its edges sharpened and dings repaired. Evo has a guide to sharpening edges and tuning if you’d like to do this on your own. If your skis have brakes, retract them so that the ski surface is flush. You might have to tether the brakes back with a band or string. Mount the skis or snowboard so that the bottom is facing up and is level. This is easy to do by propping the gear up on blocks. Cover the floor or table surface with newspaper to protect it from dripping wax. In one hand, tilt the iron vertically and hold the bar of wax against the iron with your other hand. Drip the wax into a thin trail along the surface of the board or ski. Move quickly and form a thin zigzag down the base. Place the iron onto the base and move it as if you’re ironing clothes. Do not let the iron linger on the base for too long, or you’ll risk burning it. Melt the wax until a very thin layer has covered the entire surface evenly. Don’t forget to spread it all the way to the edge. Leave your ski and snowboard to cool until it reaches room temperature – usually this takes at least thirty minutes. If in doubt, it’s better to wait too long than to scrape the wax (the next step) too soon. Scraping the wax early could pull wax completely out of the pores of your board, making the entire useless. Once the surface is at room temperature, grab your plastic wax scraper and scrape the wax off. Scrape from the tip of the board or ski and work your way back. Take care that there are no wax bumps or chunks on the edges. You want the wax to be very thin – as if it’s inside the base and not on the base. Beginners often don’t scrape enough, leaving a wax layer that’s too thick. Next, grab your buff pad or brush and rub from tip to tail in short, even strokes. This might take you five or more minutes, and will help even out and clear any excess wax. The board or ski should look like there is just a very thin layer on top. Only a small amount should come off if you scratch the surface with your nail. You can’t over-wax snowboard or skis, so how often you do it is up to you. Typically, advanced riders like to wax their gear every couple of days. When in doubt, give your skis and snowboard a wax if you can’t remember the last time they’ve been done. The more you do it, the more efficient you get.